Slim and smooth, the camouflage Silicone Protection Cover for Nikon D5300 from easyCover protects your camera body from bumps, scratches, sand and dust. The custom-fit silicone skin provides a secure grip, and there's an included screen protector to shield the LCD. 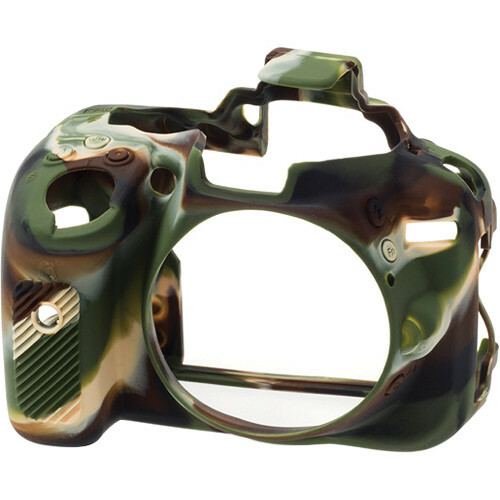 Silicone Protection Cover for Nikon D5300 (Camouflage) is rated 4.8 out of 5 by 12. Rated 5 out of 5 by JGGJ from Fits perfectly my D5300 Very well done. Easy to install, and it seems to protect a lot the camera against marks, dents or minor accidents. It also helps me to have a better grip on the camera. Rated 5 out of 5 by Brotha J! from Like A Glove! I bought this for our Nikon D5300. We upgraded from a Nikon D80. We bought an armor set (body and lens) for our D80. That set fit the camera like a pair of footie pajamas a half size to big. This armor we bought for the D5300 fits spot on! I popped into place amazingly. It fits snuggly, but not tight. All of the fuction button are covered exactly. All of the cut outs are perfect! I am thoroughly impressed with this armor. Rated 5 out of 5 by S.C. from Great Buy! I bought this cover in the event I drop my Nikon 5300 on the concrete since I shoot outside mainly or it gets banged into something. My only fear is the cover holding in heat as the camera is on which would drain the battery faster. But there seems to be plenty of space to let heat escape and still keep the camera protected. Rated 4 out of 5 by Regd from Nice Idea It does what it is supposed to. It covers the manufacture's graphics and didn't know my camera very well, so it came off for a while. Seems handy for anyone who handles the camera a lot out in the elements. All the ports and controls are accessible. If you need it, this is a good one. Does it ship worldwide? Or to Sri Lanka. Hello. Will this fit the D5100? I doubt it. I know a battery grip for the D5100 does not fit a D5300 so there are some differences in the bodies. Does it protect the camera against the rain water? No, because some buttons are not completly covered.